DON'T BREATHE REVIEW [SPOILERS] - STILL ON HIATUS! I took a mini-break from my hiatus to review 'Don't Breathe.' Similar to this Spring's '10 Cloverfield Lane,' 'Don't Breathe' took me by surprise. 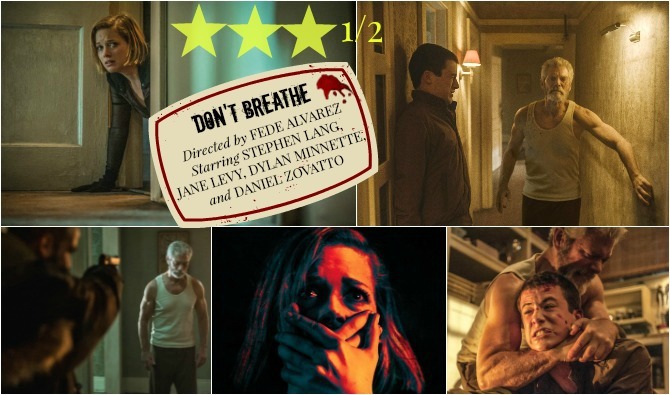 I didn't know anything about it before I went to the theater, but 'Don't Breathe' is a slick little horror film, with a great cast, and a thrilling (yet unbelievable) plot. Admittedly, the film has enough plot holes to drive a truck through it, but it kept me on the edge of my seat--which is hard to do. What I liked about the film is that none of the characters are particularly likable. This is one of the few horror films in which there are no heroes. MOVE AWAY FROM MOM TOGETHER? 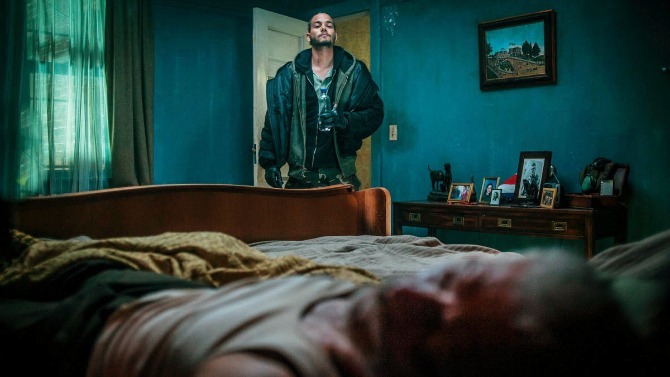 The unfortunate industrial decline of modern-day Detroit, Michigan has made it an apocalyptic filmmaker's paradise-- 'Only Lover's Left Alive,' 'It Follows,' 'Batman Dawn of Justice,' and now 'Don't Breathe.' The film opens with three unscrupulous thieves-- Rocky (Jane Levy), Alex (Dylan Minnette), and Money (Daniel Zovatto) breaking into homes that Alex has access to through his father's security company. One big plot hole in the film is how the teens manage to break into the houses. I've never heard of a security company who has keys for the houses they maintain? Security companies do not have your house keys. It would have made more sense if his father was a realtor. Plot hole number one. AS SOON AS I HAVE THE MONEY. I GOT OUR TICKET OUTTA HERE. The trio do a minute's worth of internet research to determine the blind man recently won a settlement when his daughter was killed by a rich drunk driver. The thieves believe that the nameless blind man has the cash in his house? Plot hole number 2-- why would this man have $300k cash in his house? Has no one ever heard of this place called a bank? The thieves think they have an easy mark with a blind man living in an abandoned neighborhood. 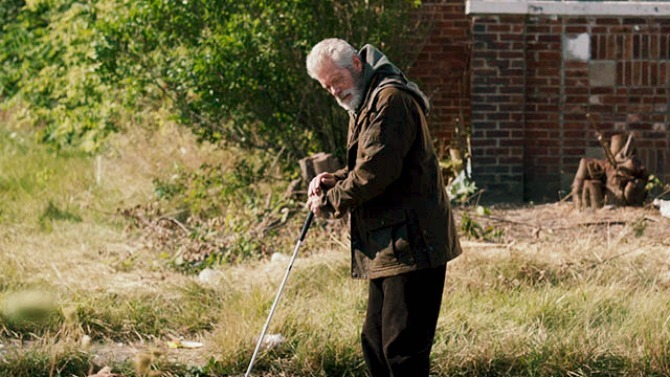 The neighborhood has been completely hollowed out by the recession and the blind man is the last remaining resident. His only company is his vicious Rottweiler. The thieves drug the dog, find a way to break into house, and start their search for the mythical money. Needless to say, the buff blind man wakes up and the "fit hits the shan." The blind man is more than meets the eye and doesn't go down easy. He has ninja reflexes and can seemingly fire a weapon with pinpoint accuracy from just sound. He's like 'Blind Fury' meets 'Punisher.' He makes easy work of them, but they prove to be more resourceful than they appear too. While we secretly root for the blind man, we soon discover that he has some of his own secrets and he's far from innocent. DON'T MEAN HE A SAINT THO. Director Fede Alvarez ('Evil Dead' remake) manages to maintain the tension and fear throughout the film, despite the plot holes. There are quite a few well done "gotcha" moments when predator becomes prey and prey becomes predator. Lang does a fantastic job as the unhinged blind man. He has very few lines, but still delivers a solid performance. The other actors do a great job as well. There are a few gruesome scenes in the film-- not necessarily gore related--more so related to body fluids. I won't get into any details, but this isn't your average "home invasion gone wrong" film. It's well-crafted, visceral, and even leaves room for a sequel. 'Don't Breathe' will undoubtedly become a cult classic. Bummer about the plot holes. Not sure I could overlook all of those. I think the action and tension of the film carries it. But yes, there were major plot holes that were not filled and made little sense. I think popcorn will heal a multitude of sins. Lots of plot holes, but a solid film. I haven't seen this one but I've read enough reviews to know the plot twist. From your review this sounds like two thirds of an amazing film and one third of a turkey. Worth watching though. I really enjoyed it. It was lots of fun. There were parts that made absolutely no sense, but most horror movies don't make sense. Overall it was a fun, tense thriller. Kept me on the edge of my seat. Stephen Lang was fab. I like the way you now have a list of movies which you've crossed off because you are no longer going to reviews them. I think a lot of us are doing the same thing (but often less openly) because the current movies just drain the life out of us so much that we can't be bothered to write about them anymore. It's so true! I just don't have the energy to review some of these crappy films. I will likely do my end of the year best and worst lists. I am also in grad school so my film viewing has been very limited lately. I'm on a month long break so I will try to get a few reviews in! I hope you're doing well.